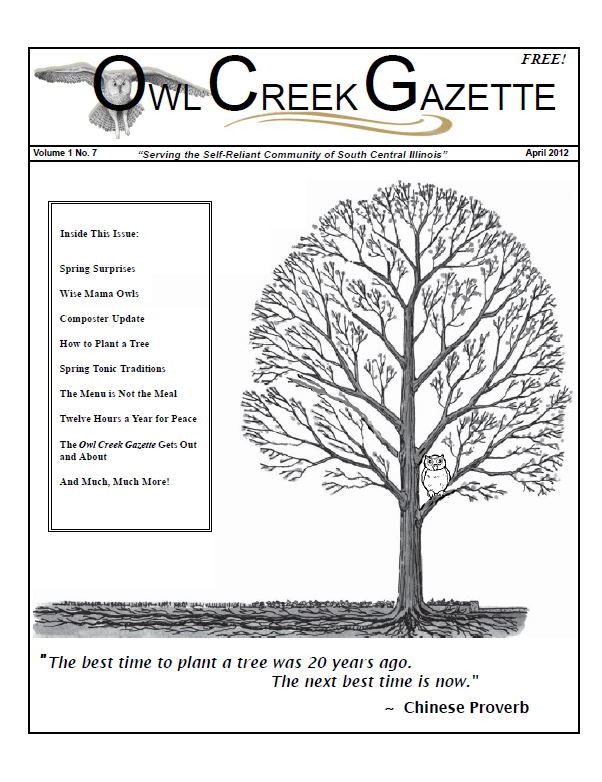 Owl Creek Gazette: Our April 2012 Issue... A Little Something for Everyone on the Pages of the Owl Creek Gazette! Our April 2012 Issue... A Little Something for Everyone on the Pages of the Owl Creek Gazette! You'll find the complete magazine online via our Archived Issue page! Happy Reading! A friend of mine sent me a copy of your magazine, and though I haven’t had a chance to read the entire publication yet, I'm already tremendously impressed with its content and low-key perspective. Your community is really fortunate to have a couple like you who care enough about lifestyle changes that are so essential and so necessary in these times that they are willing to "go out on a limb" like this. 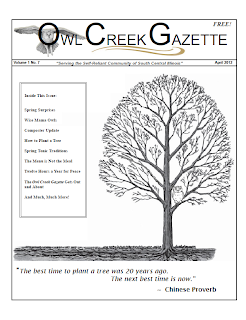 The Owl Creek Gazette is like a breath of fresh air!